Doctrine of God: Nature and character of God. Understanding God as a person by looking at Jesus. Doctrine of man: Man’s origin and purpose. Understanding myself as a person by looking at Jesus. Doctrine of salvation: The fall of man and work of God for man. The work of the Holy Spirit as it relates to salvation and the life of the saved, (Other ministries of the Holy Spirit taken up with appropriate subjects.) Principles and precepts relating to the life of the saved. Doctrine of the Home: Its’ governing principles, precepts and its responsibilities. Doctrine of the Church: The Biblical Church, The local church government and responsibilities. Its’ importance to the saved and work in the world. Doctrines of other Privileges and Responsibilities: relating to life in Christ and service to Him. Doctrine of Dispensations: (periods of time) Seeing the heart of God in the History and Future of man. God gave seven different ways to demonstrate faith in Him at different times. As shown to us in the book of Revelation, as they relate to the rapture, judgment seat of Christ, tribulation, millennial kingdom, white throne judgment, new heaven and earth. HOW TO GROW IN THINKING THROUGH THIS COURSE. 1. Research: Read each section once then read it again using your Concordance and, or, a Topical Bible to look up all verses for context. Also, to find other verses that speak on the same subject or principle to confirm or question statements made in this course. It is my obligation to present the truth, it is your obligation to check it out and prove it true or false. 2. Write a summary: of all references given to Consider: in each unit in your own words, this will greatly help your develop in the comprehension of the scriptures..
HOW TO SUMMARIZE SCRIPTURES Passage to be summarized: Consider: Jer. 9:24 "But let him that glorieth glory in this, that he understandeth and knoweth me, that I am the LORD which exercise lovingkindness, judgment, and righteousness, in the earth: for in these things I delight, saith the LORD." Summary: God says you can know and understand Him. Do a longer passage in the same way. Consider: 2 Cor. 5:14-21 "For the love of Christ constraineth us; because we thus judge, that if one died for all, then were all dead: And that he died for all, that they which live should not henceforth live unto themselves, but unto him which died for them, and rose again. Wherefore henceforth know we no man after the flesh: yea, though we have known Christ after the flesh, yet now henceforth know we him no more. Therefore if any man be in Christ, he is a new creature: old things are passed away; behold, all things are become new. And all things are of God, who hath reconciled us to himself by Jesus Christ, and hath given to us the ministry of reconciliation; To wit, that God was in Christ, reconciling the world unto himself, not imputing their trespasses unto them; and hath committed unto us the word of reconciliation. Now then we are ambassadors for Christ, as though God did beseech you by us: we pray you in Christ's stead, be ye reconciled to God. For he hath made him to be sin for us, who knew no sin; that we might be made the righteousness of God in him." Summary: God deserves and wants the life that He paid for, to make it a new life in service to Him. Summarize all Scriptures to Consider: in the outlines. Note: You only have to summarize a given Scripture one time in each section unless it is combined with others in a longer passage. _____ John 14:31 The love of Christ is unending. _____ Phil. 2:6-7 The price of love. ______1 Cor. 13:1-13 Love defined. ______Rom. 8:34-35 Nothing can take us from the love of God. _____Luke 15:5 Rejoicing over the recovery and return of the stray. _____ John 17:13 Jesus shared the means of having His Joy. It is important to do all the text to Consider: in each unit this way. Through meditation on each passage or verse, it will open your heart to the meat of the Scriptures. It teaches you to meditate and think, discerning facts from human wisdom, making you more capable than most so called intellectuals. Most of which are nothing more than clones of their teachers. 3. Fulfill all Assignments, they help you to think and meditate. 4. There will be Self test for you to answer at the end of topic or section of the course. Thinking through the facts you have learned [meditation] you gain wisdom, the knowledge of application of God's Word for your life. 7. Be sure you follow your syllabus and assignments for each section before going on to the next. They are your guide to this course, and give a proper sequence of study and assignments and tests. By the Lords grace, you will be able to stand equal to any, and ahead of most. God bless you as you study of Him and His Word, may the promise of Rom 8:28 be yours. THE AUTHORITY OF THE SCRIPTURES No study would be effectual if it were not authoritative. Though I claim no authority of myself, I do claim the authority of the Scriptures, and give the following reasons for doing so. Let us begin with the oldest revelation of authority written by God, Consider "The Gospel in the Stars" Gen.1:14 And God said, Let there be lights in the firmament of the heaven to divide the day from the night; and let them be for signs, and for seasons, and for days, and years: Consider Amos 5:8 Seek him that maketh the seven stars and Orion, and turneth the shadow of death into the morning, and maketh the day dark with night: that calleth for the waters of the sea, and poureth them out upon the face of the earth: The LORD is his name: Consider Job 9:9 Which maketh Arcturus, Orion, and Pleiades, and the chambers of the south. Again in Job. 38:31 Canst thou bind the sweet influences of Pleiades, or loose the bands of Orion? These are signs called constellations are in the heavens. There are twelve major signs plus others that tell the story of the gospel, and are in perfect agreement with it. God had to put them up there, and gave mankind the ability to read them, so that there was a preacher for all to hear from Adam to God's judgment of the flood. Did you know a system for hieroglyphs in the skies known as constellations was exhumed among the remains of Assyerians, Chaldeans. The same things have been found among primitive peoples antedating the founding of Babel. Some of the same kind of forms and designs were found on tablets in cuneiform in writings before Moses time. Studies of ancient peoples understanding of constellations in their religious elements in old civilizations such as Iranian or Mithras, Aryans, Bactrians, Indians, Medes, Persians, Chaldeans, Hindoos, Chinese, Egyptian, Romans, and Greeks, long before Jewish and Christian writtings. Investigators came to the same basic conclusion. That God preached His the Gospel (Bible) in the stars, for all to understand and put their hope and faith in Him. THERE IS AN UNBROKEN UNITY IN THE PERSON AND WORK OF GOD FOR MAN. That unity is declared in 66 books written by 38 authors over a period of more than 1600 years. Though many were contemporaries of one another, few communicated with each other. Such unity is impossible in the writings of men, but not for God. There has not been one failure in almost 6000 years of Biblical history! Is not that alone sufficient reason to put our faith in the Scriptures as the authoritative Word of God? 3. THE BIBLE CLAIMS THE FINAL AUTHORITY FOR FAITH AND PRACTICE. Jesus Christ, the Lord, has the authority to authenticate the Scriptures, for He is the Living Word of God. "In the beginning was the Word, and the Word was with God, and the Word was God. The same was in the beginning with God. All things were made by him; and without him was not any thing made that was made. And the Word was made flesh, and dwelt among us, (and we beheld his glory, the glory as of the only begotten of the Father,) full of grace and truth." John 1:1-3, 14. 4. THE MIRACLE OF THE PRESERVATION OF GOD'S WORD TO HIS PEOPLE. "The words of the LORD are pure words: as silver tried in a furnace of earth, purified seven times. Thou shalt keep them, O LORD, thou shalt preserve them from this generation for ever." Psalm. 12:6-7 No writings of man have ever endured the centuries of oppression and attempts to destroy it from the face of the earth, as the Scriptures have, yet today they are available world wide. There are no other writings that can make these claims. However there is yet another reason I believe God is real, Jesus is real, and the Holy Spirit is real, yes that this Book is real. It is the most solid evidence of all. How is that change taking place? I am being made a new creature in Christ, through His living in me, conforming me into His image and likeness, through the agency of His Spirit and His Word. "And we know that all things work together for good to them that love God, to them who are the called according to his purpose For whom he did foreknow, he also did predestinate to be conformed to the image of his Son, that he might be the firstborn among many brethren. Moreover whom he did predestinate, them he also called: and whom he called, them he also justified: and whom he justified, them he also glorified.31What shall we then say to these things? If God be for us, who can be against us?" Romans 8:28-31 This is the absolute will of God for every believer in Christ. That change is taking place in the life of every true believer, and will continue to the time that one is taken up to be with the Lord. There are no exceptions, for the Holy Spirit does not fail His assigned work, and the instrument He uses is the Word of God. Is not that changing life sufficient reason to put our faith in the Scriptures, as the authoritative Word of God? The continuing change in the life and ministries of the believer is the only evidence of the power of God on their lives, and in their ministries. If that change is taking place there will be no room for doubt concerning the reality and power of God on and in their life, both for them, and those around them. For all of these reasons I have confidence in the Bible (Scriptures) as God's Word, and my final authority for my faith, life, and practice. How about you? Warning: There are many Books called Bibles not all can be considered the Word of God. I believe the Authorized King James version is the most reliable copy of God's Word preserved for the English speaking world. Best explained by reading a book showing the perversions of modern translations and paraphrases of the Bible titled "New Age Bible Versions" by G. A Riplinger Published by A.V. Publications Box.388 Munroe Falls Ohio 44262. Self test: on the Authority of the Scriptures. These questions are more than an academic quiz, they help you think through the facts you have learned, so that you can form convictions as to the will of God for your life. Remember meditation on God's Word is the key to gaining wisdom, and only when it is applied in your life are you assured of being in the will of God and the place of His blessing. Q1. Do you have the conviction, that the Bible is the Word of God? If not why not? Q2. If you do, what reasons can you give for your conviction of the authority of the Bible. Q3. Do you plan to investigate the authority of the King James Version by reading the "New Age Bible Versions" by G. A. Riplinger? Q4. Do you believe some people venerate the King James Bible, if so how? Q5. Why is it important to understand and settle these questions? How to Study the Bible ? LEARNING ABOUT GOD AND HIS WAYS REQUIRES STUDY! 4. The PRECEPT of study is meditation. [thinking through its meaning and implications] "O how I love thy law! it is my meditation all the day. Thou through thy commandments hast made me wiser than mine enemies: for they are ever with me. I have more understanding than all my teachers: for thy testimonies are my meditation." Psa.119:97-99 It is through meditation on God's Word that we learn to know God's heart and see through His eyes. 6. The PRODUCT of study is conviction. "These were more noble than those in Thessalonica, in that they received the word with all readiness of mind, and searched the scriptures daily, whether those things were so. Therefore many of them believed; also of honourable women which were Greeks, and of men, not a few." Acts 17:11-12 . What else has been said about it? 2. SEE THE ACTION AND UNDERSTAND IT. This requires meditation on the facts, while keeping in mind the nature and character of God and His will for man in His responses, as well as mans. All must be in harmony with the principles and precepts, expressed or implied. What response is expected [Our responsibility] (1) in the eyes of God ? (2) of those spoken to ? (A) That all actions expressed or implied by our application must be in harmony with the nature and character of God, as revealed by His attributes and the life of Christ. (B) That all actions expressed or implied by our application must be in harmony with the known will of God for man as revealed by the Scriptures. (C) That all actions expressed or implied by our application must be in harmony with those things accepted by Christ. (D) That all actions expressed or implied by our application must be in harmony with those things that are rejected by Christ. 1. A Text without context is pretext. 4. Application is our responsibility. After learning the facts we must decide to obey or disobey. "This day the Lord thy God hath commanded thee to do these statutes and judgments: thou shalt therefore keep and do them with all thine heart, and with all thy soul." Deut. 26:16 "This book of the law shall not depart out of thy mouth; but thou shalt meditate therein day and night, that thou mayest observe to do according to all that is written therein: for then thou shalt make thy way prosperous, and then thou shalt have good success." Joshua 1:8 "And why call ye me, Lord, Lord, and do not the things which I say? " Luke 6:46 Some one said: "True faith is committing myself to God so that I respond to Him by acting on what He says." 1. Set aside a definite time for daily study. Make it your priority over all other activity. 2. Pray before and after each time of study and research. Ask the Lord to open your mind and heart to understanding and give you a teachable spirit, willing to apply it to your life. 3. Use a concordance, topical reference, dictionary, etc. to find other texts on the subject, to confirm or question statements or position made in this course. 4. Be sure to use principles of interpretation and application, not your own preconceived ideas, remember you are to be learning God's point of view, not justifying your own. Your goal is to find God’s will and be able to say "thus saith the Lord." 5. Use your Scripture study guide to gain a good habit and form of questioning the Scriptures to understand what God has said, as well as confirming truth, or exposing error in all that you read or hear. It also helps you find the principles and precepts to be applied in your life, in order to be in the will of God. 6. Summarize all the verses in your own words, either individually or collectively, for each topic or point in your outlines. Place these behind each outline, these will become your own topical Bible commentary based on your own research, whereby you can say "thus saith the Lord" as to His will on that subject. It will be a foundation for your convictions, and a basis for your decisions in the will of God for your life. 7. Make a list of questions as they arise, so they are not forgotten, be it interpretation or application in your life or the lives of others. send them so I can help you find an answer. I regard all questions as important, for they are. Manners And Customs of the Bible (By James M. Freeman) Not necessary but very helpful. Another good tool for research is. . . The TREASURY of SCRIPTURE KNOWLEDGE (By Revell)giving 500,000 Scripture references and parallel passages. This book is in fine print best have a magnifying glass to avoid eye strain but well worth the effort using it. 9. If you use a commentary, never use it to interpret or redefine the Bible. Only let the Scriptures interpret its self. Or you do not have God's Word. Only use the commentary to see how others view it. 10. Be sure to follow your syllabus, it is your guide in the course. It gives the proper sequence of study, assignments, and tests. Q1. Who is to study God’s Word? Q2. Why is the study of the Bible so important? Q3. Why is context so important and how do you arrive at it? Q4. What rules must you use to test your interpretation and application of God’s Word? Q5. What questions must you ask for God's Word to be of value to you? Q6. How do you attain the value of study? Q7. Consider again, and explain the consequences of applying or not applying the following Scriptures to your life. Life. (A) Rom.10:9-17 .B) 2 Cor.5:18-20. C) 1 Pet.3:15. You are now ready for the next subject in this Unit; God Has Goals for Your Life. God has Goals for your life. God is intensely interested in the outcome of your life. Knowing your potential He has set goals for it. However, it’s fulfillment in reaching that potential is dependent on your cooperation and commitment to God's goals for you. God's heart is seen in His Goals for you. Think about it and fill in the dates you can. GOD HAS A PART IN YOUR REACHING THE GOALS HE HAS SET FOR YOU. 2. Through sending His Holy Spirit. . . .
"And grieve not the holy Spirit of God, whereby ye are sealed unto the day of redemption." Eph. 4:30 We are not to hold our rights above His. YOU HAVE A PART IN YOUR REACHING THE GOALS GOD SET FOR YOU. Self test: on God's Goals for your life. Q1. Of the goals God has for your life which ones have been harder to attained? Q2. Why are you taking this course? 1 assignment: Send in a copy of the goals reached by God and you. You may send in you this self test now, or hold all your self test for this unit and send them in together at the end of this unit, Before starting unit two. You are now ready for sixth subject in this unit; BEWARE OF CULTS THAT TAKE THE NAME CHRISTIAN Keep in mind they are not only in churches but on Radio and TV and Internet. They are easily identified for they all follow a pattern, learn it, watch out for it. Remember they camouflage their real identity with Scripture and Scriptural terminology, but mostly with the use of the names God and Jesus Christ. They always use it, so learn to identify it. I call it the process of sin. said, Ye shall not eat of it, neither shall ye touch it, lest ye die. . .
2. And the serpent said unto the woman, Ye shall not surely die: For God doth know that in the day ye eat thereof, then your eyes shall be opened, and ye shall be as gods, knowing good and evil. . .
1. Satan subtly gets his victim to listen to him. 2. Satan brings doubt to God's Word, using lies and half truths that equal a lie. 3. Satan gets his victim to make a judgment by rationalism and experience in place of God's Word. The result is, the god of this world gets his victim to follow him in place of the God of heaven, which is the fourth step in the process of sin. Beware this is the same pattern used by the cults, as well as the occult. Satan does not change his methods. So let’s now look at the approach used by cults, particularly those that take the name Christian. 1. Gen. 3:1-3 BEWARE! and consider: Cults claim to be spokesmen for God, while bringing doubt to what God has said in the Scriptures. "And this I say, lest any man should beguile you with enticing words....Beware lest any man spoil you through philosophy and vain deceit, after the tradition of men, after the rudiments of the world, and not after Christ." Col. 2:4, 8. "Beloved, believe not every spirit, but try the spirits whether they are of God: because many false prophets are gone out into the world." 1 John 4:1 "These were more noble than those in Thessalonica, in that they received the word with all readiness of mind, and searched the scriptures daily, whether those things were so." Acts 17:11 "Study to shew thyself approved unto God, a workman that needeth not to be ashamed, rightly dividing the word of truth.....All scripture is given by inspiration of God, and is profitable for doctrine, for reproof, for correction, for instruction in righteousness: That the man of God may be perfect, throughly furnished unto all good works." 2 Tim. 2:15, 3:16-17. Faith in Christ is not the result of observing supernatural experiences with the dead, but the gift of God, as a result of receiving Christ and God's Word. BEWARE and consider: "Then he said, I pray thee therefore, father, that thou wouldest send him to my father's house: For I have five brethren; that he may testify unto them, lest they also come into this place of torment. Abraham saith unto him, They have Moses and the prophets; let them hear them. And he said, Nay, father Abraham: but if one went unto them from the dead, they will repent. And he said unto him, If they hear not Moses and the prophets, neither will they be persuaded, though one rose from the dead." Luke. 16:27-31 Abraham's statement was vindicated later at the time of Jesus crucifixion. "And the graves were opened; and many bodies of the saints which slept arose, And came out of the graves after his resurrection, and went into the holy city, and appeared unto many." Mat. 27:52-53 Notice: There is no Scriptural evidence that any were saved by their supernatural appearance unto them. "For by grace are ye saved through faith; and that not of yourselves: it is the gift of God: Not of works, lest any man should boast " Eph. 2:8-9"For whosoever shall call upon the name of the Lord shall be saved... So then faith cometh by hearing, and hearing by the word of God." Rom. 10:13, 17. SOME CULTS DENY THE EXISTENCE AND REALITY OF HEAVEN AND HELL BEWARE! and consider: the words of Jesus who does not lie. "There was a certain rich man, which was clothed in purple and fine linen, and fared sumptuously every day: And there was a certain beggar named Lazarus, which was laid at his gate, full of sores, And desiring to be fed with the crumbs which fell from the rich man's table: moreover the dogs came and licked his sores. And it came to pass, that the beggar died, and was carried by the angels into Abraham's bosom: the rich man also died, and was buried; And in hell he lift up his eyes, being in torments, and seeth Abraham afar off, and Lazarus in his bosom. And he cried and said, Father Abraham, have mercy on me, and send Lazarus, that he may dip the tip of his finger in water, and cool my tongue; for I am tormented in this flame. But Abraham said, Son, remember that thou in thy lifetime receivedst thy good things, and likewise Lazarus evil things: but now he is comforted, and thou art tormented. And beside all this, between us and you there is a great gulf fixed: so that they which would pass from hence to you cannot; neither can they pass to us, that would come from thence." Luke 16:19-26 Take note: one was in Abraham's bosom in the place of blessing with Abraham in Paradise The other in a burning hell and torment. There was no way you could get out of hell once you were there. Jesus said no one can come back from heaven or hell to help any one. Jesus' words clearly expose the cults false doctrine of purgatory and reincarnation (transmigration of the soul) or body. Such doctrine is traceable to the ancient pagan religions but not to historical Biblical Christianity. Again we take note that Jesus went on to say the only way to keep out of hell was to believe God's Word in this life, before you get there. "Then he said, I pray thee therefore, father, that thou wouldest send him to my father's house: For I have five brethren; that he may testify unto them, lest they also come into this place of torment. Abraham saith unto him, They have Moses and the prophets; let them hear them. And he said, Nay, father Abraham: but if one went unto them from the dead, they will repent. And he said unto him, If they hear not Moses and the prophets, neither will they be persuaded, though one rose from the dead." Luke 16:27-31 These words of Abraham were vindicated at the time of Christ’s death: "Jesus, when he had cried again with a loud voice, yielded up the ghost. And, behold, the veil of the temple was rent in twain from the top to the bottom; and the earth did quake, and the rocks rent; And the graves were opened; and many bodies of the saints which slept arose, And came out of the graves after his resurrection, and went into the holy city, and appeared unto many." Mat. 27:50-53 There is no Scriptural evidence any got saved as a result of such an experience vindicating what was said by Abraham and quoted by Jesus. Q1. 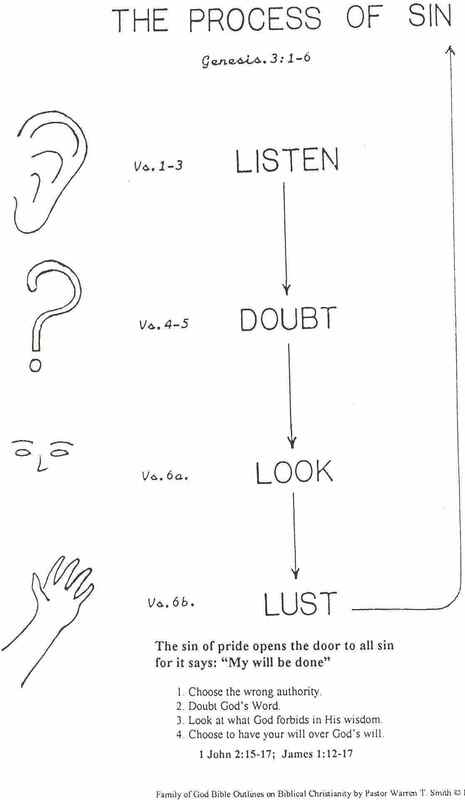 What are the three steps in Satan's process of leading his victims by deception? Q3. What do cults offer in place of a changing life, through Christ and His Word living in you? Q4. Some say they have had near death experiences, that is, they were in a disembodied state being between life and death seeing heaven or hell and given a second chance to come back to life. What do the Scriptures say concerning that experience? Q6. What is your best defense from being taken in by cults or the occult? Q7. Consider: Ezek 33:1-20 and ask yourself will God consider you your brothers keeper? Q8. What should you do if He does? You are now ready to start Unit 2a The Pastor's heart and course orientation. Now go do what is right in the eyes of the Lord and may your decisions bring you the promise Romans 8:28 " And we know that all things work together for good to them that love God, to them who are the called according to his purpose."